Apples originated in Western Asia but are now grown in temperate climates throughout the world where there are warm days and cool nights. The different varieties of apples range in the thousands with each having its own unique color, shape, texture and flavor. If you have ever gone to an apple orchard or farmer's market you may be surprised to find varieties that never make their way to grocery stores. Happily there is a renewed interest in trying varieties other than the standard Red Delicious, Golden Delicious, Granny Smith, etc. and nothing beats the taste and texture of a freshly picked apple. Flavors can run the gamut from very sweet to very tart and textures can be soft to hard and crunchy. Think of apples like grapes in winemaking where the nuances of flavor can change from one harvest to the next, even one grower to the next. Weather has a major influence on both the flavor and the size of the apple. But remember that apples are not perfect in shape or size and some even have blemishes or what is known as russeting, rough textured, brown-colored spots. These are harmless and in fact some say a sign of quality. Commercially grown apples, which supply your local grocery stores, tend to be blemish-free and perfect. This is achieved by making sure the trees have no pests or diseases. You may notice that the apples in grocery stores are all similar in size, that is, mainly large. Spraying the trees early in the season so that any undersized apples fall from the trees ensures large apples. The goal is for maximum yield of large sized apples which will ship and store well. Commercial apples are usually picked under ripe and then refrigerated to slow the ripening process. For long term storage they are kept in climate controlled spaces where the oxygen level is reduced and carbon dioxide is increased. 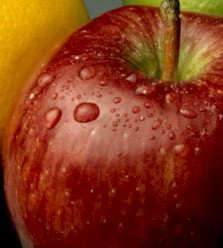 Some supermarket apples have an attractive sheen, which is accomplished by coating the apples with a thin layer of wax. This wax is tasteless and harmless and it not only makes the fruit look good but it also preserves the flavor of the apple and slows down moisture loss in cold storage. When choosing apples look for well-colored, firm apples with a fresh, never musty, smell. Apples should be smooth and free of soft spots, bruising, or holes. Larger apples tend to be mealier than smaller ones. Apples are available year round but are at their best when harvested, August through November (in North America). To ripen fruit leave at room temperature. For longer storage place apples in a dark, cool place. If you live in a warmer climate you can also store them in the refrigerator in plastic bags. Apples give off ethylene gas which speeds ripening of vegetables and can also make carrots bitter, cucumbers yellow and brown spots on lettuce. For best flavor, serve apples cold. To preserve the color of peeled and sliced apples, drizzle with a little fresh lemon juice. When baking with apples using a blend of tart and sweet or spicy and mild will give your baked goods added flavor, texture and dimension. Apples can be baked, frittered, poached, sauteed, and steamed. Vanilla, almonds, cinnamon, cloves, nutmeg, cardamom and lemon are some ingredients that complement the taste of an apple. Red, green, yellow and brown; sweet, tart, mellow, spicy; firm and crispy or soft-textured and sweet. Apples can be classified as baking, dessert or eating apples, and cider-making apples. When used in baking, it is important that the apple used has the desired flavor and texture and also complements the other ingredients in the recipe. Listed below are some common varieties of apples found in North America. It is a general guide to baking and eating with apples so be sure to taste the different varieties of apples in your area. One pound of apples (454 grams) roughly equals 2 large, 3 medium, or 4 small apples. This well-known proverb is thought to originate from the belief that apples have the most curative powers of all the fruits. Apples are not only rich in pectin, but they also provide dietary fiber, contain potassium, Vitamin C and beta-carotene. Raw apples are said to promote dental health.